Accompanying us each day was the sun's flaming orb, rising each morning and setting each night - an unvarying ball of fire burnishing the red sandy deserts of Namibia. Our journey began in Windhoek, the Namibian capital. We headed off across the desert aboard an air-conditioned, diesel-powered vehicle with reclining seats and sliding windows. It had a raised chassis, designed to keep clear of the dust and small stones thrown up by the wheels. I sat next to the driver Lutz Paschke, who was also our guide and tour manager, so I took advantage of our proximity to collect first-hand information about Namibia. 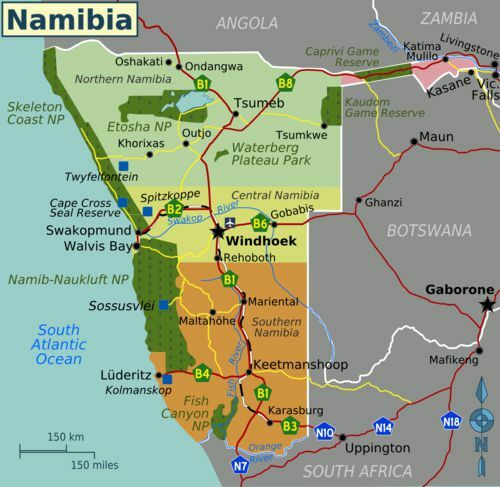 Namibia covers a huge area – over 827,000 sq kilometres – but has the second-lowest population density in the world – after Mongolia. The main ethnic group is the Bantu, while the whites, the majority of whom have afrikaner origins, make up just 4-7% of the total population of around two million. Untold riches lie beneath its surface – uranium, diamonds, lead, tungsten, gold, aluminium, fluorine, manganese, marble (they even export to Italy! ), copper and zinc, but many mines have had to be abandoned due to the lack of sufficient water to wash the minerals. Agriculture and livestock farming are another source of wealth and potential for development. The main industries are mining, fishing and food processing – there are no car factories, vehicles being imported from South Africa or directly from the producing country – you see a lot of Toyota pick-ups, as well as Nissans, Hyundais, Volkswagens, BMWs, Fords and Land Rovers. Due to the scattered nature of the practically non-taxpaying population, the Government does not have sufficient funds to provide universal healthcare or education, which should in theory be guaranteed by the Constitution. So private enterprise (run mainly by whites) is favoured instead, being seen not only as a means of creating employment, but also as being easily monitored and hence taxable. The arrival from Europe of both Catholic and Protestant missionaries during the nineteenth century, converted most of the population to Christianity, although evidence of ancient animist rites can still be found in some parts of the country. The desert of Namib is crossed by unsurfaced roads in terrible condition, and there are no service stations along the way. However the extreme beauty of the panorama more than made up for our fatigue, and everyone was glued to the car windows. After many hours of jolting and rattling, at the end of the first day it was a relief to get to the comfort of the Hammerstein Lodge where we spent the night. We were up again next morning at 4.30 with another long haul ahead of us. Early rising was the rule, in order that we could get to the next destination in time for hotel rooms to be allocated and local information to be imparted. But getting up at the crack of dawn also meant that we were able to enjoy the spectacle provided by the endless variations in the colours of the sand dunes: carmine, crimson, brick-red, purple, ruby red, scarlet, vermilion. Their colour changed according to the light filtering through the clouds, the reflection of the sky, the shadows on the ground and the transit of the sun from east to west: that ball of fire hanging in the sky each morning which was the same ball of fire we saw every night before darkness fell. The apparently rocky formations along the roadside were an assortment of shapes and sizes: some looked like castles, pinnacles, mountainsides, or trenches hollowed out by wind and water. It was only when we came closer that we found they were made of very fine sand, a sort of dust or dirt that slipped through our fingers. Our guide told us that the dunes haven’t moved for thousands of years, although slight changes in the most exposed hilltops could sometimes be seen. That is in contrast to what still happens in the Libyan desert, in centuries past traversed by caravans of dromedaries travelling from the Atlantic to the Red Sea, carrying goods for trade and at the same time introducing new ideas and ways of life. Even at the beginning of the 20th century, daring explorers who dreamed of finding the lengendary oasis of Zarzura, or who had set off for Cufra, described how they had risked their lives because of the continual movement of the sand dunes. They also reported that the caravans caught in sudden gales or dust storms were hardly ever able to find the oases and water wells already identified that could have saved the lives of men and animals. Comparing photos, the dunes of the two deserts reveal similar characteristics; as do the cave paintings and graffiti which display a certain artistic affinity, undoubtedly influenzed by the relationship between man and nature in such similar climes. In both you can see elephants, camels, giraffes and ostriches as well as scenes of hunting and daily life. During our crossing of the desert of Namib we drove across several riverbeds, which our guide told us sometimes held water. This year they were all bone-dry. We were heading towards Sossusvlei. Vlei means swamp. In ancient times a great river flowed through here on its way to the Atlantic Ocean. However the dunes had formed, creating a barrier and the river dried up. If you want a view of the sea, you can walk up to the top of the dunes – a mere 45-kilometre trek. We met a German couple who had made the climb; however having lost the keys of their rented jeep on the way up, their feelings of achievement were somewhat diminished! 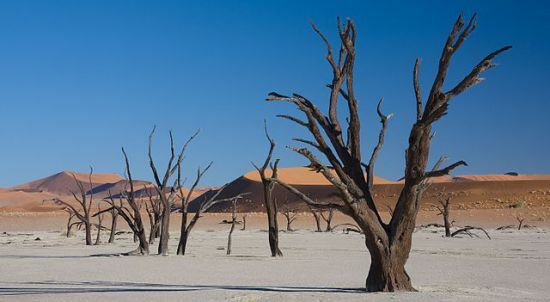 We spent some time in the Deadvlei, the Death Swamp (known as Death Valley), a large depression among the dunes which was once an oasis of acacia trees. The dead trees and bushes have been preserved unchanged for untold years, due to the absolute lack of humidity, their blackish hue contrasting strikingly with the white sand of the valley floor. Nature however has not surrendered – we saw trees with feathery yellow shoots which looked like mimosas, and there were tiny birds flying around all over the place. Another terrible stretch of track took us to the Sesriem Canyon where water flows every five to ten years. It can be viewed from above, but when it is dry can also be traversed on foot. In the reddish walls of the canyon, bushes and even a few trees have taken root in the rocks hollowed out by the water. Our second day ended at the excellent Namib Desert Lodge and the usual buffet meal. Next morning our first stop was just a half-hour’s drive away from the Lodge – at a service station called Solitaire. Despite being a tourist shopping stop which boasted an excellent bakery and European-style toilets, the nearby desert was littered with the rusting carcasses of vehicles, which for some reason had been abandoned there. We carried on along another dirt road where every passing vehicle stirred up a dense cloud of dust, practically obscuring all visibility. Drivers therefore tried to avoid being overtaken, keeping to the centre of the road whenever possible. We went up through Gaub Pass and then down into the canyon of the same name, hollowed out by a long-forgotten river and then on towards Kuiseb Canyon whose name means “always green” – in memory of times in the distant past! We crossed the Tropic of Capricorn which runs between the two canyons, and then on to Walvis Bay on a good tarmac road. From afar we could see the little pink flamingos in the lagoon which give their name to the area. The international airport at Walvis Bay, (used mainly for the transport of fish as well as marble and granite) is Namibia’s second, after Windhoek. Less than 50 kilometres away lies Swakopmund, Namibia’s second-largest city. We had two nights there in the five- star Plaza Hotel! They didn’t serve evening meals, so that night we ate at an Indian restaurant called Garnish. Next morning we had time for a quick look around town, where we shopped for souvenirs in the various supermarkets, tourist shops, local arts and crafts shops and antique markets where for a few Namibian dollars (1 euro = 15.455 NAD) we found small gifts for relatives and friends back home. In the evening we had tuna steak and grilled butterfish at Kucki’s pub. Our excursion the following day took us on a long ride along exceptionally dusty, bumpy roads with ups and downs as breathtaking as a roller coaster! We travelled along the coast for a short distance where it appeared to be raining – however we soon realized that it was just fog and humidity coming off the sea. Quite soon afterwards we had a pitstop at Hentiesbaaf, a trendy resort where wealthy families have holiday homes almost right on the beach, with superb views of the ocean. There were also a number of saltpans – apparently the concentration of salt is much higher in the sea here than normal. We then headed into the interior towards a town called Uis, whose name means aluminium. The old mines in the area which had been obliged to close due to lack of water have now been bought up by private businesses who intend to reopen them – taking advantage of the electric power lines and tarmac road available. We turned north, travelling across a desolate plain which millions of years ago had been covered by the sea. On the horizon to our left rose Brandburg Mountain, whose Koenigstein Peak is Namibia’s highest at 2573 metres. Situated in Damaraland, in the northern part of the Desert of Namib, the mountain is about 80 kilometres from the Skeleton Coast. The area around it is the locality of some important archeological sites where rock paintings and graffitti dating back some 2,000 years have been brought to light. These are the work of the San people – the so-called Bushmen. A particularly famous one is the White Lady rock painting deep within Brandburg Mountain itself. Generally the subjects of the paintings are hunting scenes, with warriors armed with bows and arrows and animals like elephants, giraffes, lions, rhinos and even sea lions. Our guide told us that giraffes were considered sacred by the Bushmen and hence that they should not be killed. In her book about the Bushmen, “The Harmless People”, the ethnologist E.M. Thomas wrote that those guilty of giraffe killing were condemned to death, even if they were unaware of the ban. Meaning “mountain of fire” in German and Afrikaans, the name Brandberg was given to the massif for the brilliant rust-colour it takes on at sunset. The Damara people called it “Daura” which means “the burning mountain”, while for another Bantu tribe, the Herero, its name is Omukuruvaro or “the mountain of the gods”. It is easily visible from a great distance due to its massive size and the lack of mist, so characteristic of extremely arid regions. The small village of Uis is around 30 kilometres from the base of Brandberg Massif. We crossed a stony plain – deserted, apart from the occasional unattended herd of goats and one or two huts on the horizon – and passed through Sorris Sorris where the sandstone rocks, formed by grains of quartz, feldspar and mica conjured up images of the surface of Mars as we might imagine it to be. Twyfelfontein (“Uncertain Spring”) was our next stop. Located about 90 kilometres east of Khorixas, Twyfelfontein is the only place in Namibia on UNESCO’s World Heritage list, being the country’s most important site of rock paintings and engravings, some dating back 2/3,000 years. The nearby Petrified Forest is equally remarkable, being composed of gigantic petrified tree trunks up to 30 metres long with a circumference measuring 6 metres. The trunks have neither roots nor branches, and it is thought that they were transported here by a massive flood at the end of the Ice Age, 260 million years ago. This forest is evidence of a natural eco-disaster which took place long before the arrival of humans. Namibia’s unique fossil plant, the Welwitschia Mirabilis, can also be found in this zone. The wildlife in this area was the most abundant and varied we had seen: desert elephants (an amazing example of adaptation to adverse climatic conditions), black rhinoceros, numerous ostriches, springboks, dik diks, steenboks, babboons, antelopes, porcupines, zebras, and giraffes. Next stop was a “traditional” Damara village which was actually a living museum run by the Damara people. This village was the first Damara project in Namibia and is the only one of its kind in the world. Along with the Bushmen, the Damara are one of the most ancient peoples of Namibia, but their culture has fallen into neglect. This “museum” represents their efforts to keep their culture alive, giving visitors a chance to experience traditional Damara life and at the same time affording the locals a source of income. Travelling to Vingerklip Lodge, where we spent the fifth night, we saw more examples of local enterprise – along the roadside people had put up small stands to sell locally produced goods and buxom, bare-breasted women, were allowing themselves to be photographed for a modest sum. The following day we set off on the final leg of our trip – 300 kilometres, destination Etosha National Park in the far north of Namibia. En route we stopped at Outja to give our troupe a chance to get to a bank or a chemist before driving on to Okaukuejo at the entrance to the park. 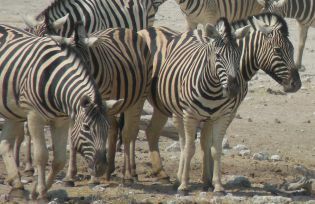 We were staying at the pretentious and disorganized Etosha Safari Camp. I asked for a room near reception in order to avoid getting lost in the dark on my way back from the dining room. First thing next morning our adventure in Etosha Pan began. It is believed that around 12 million years ago this was a shallow lake fed by the River Cunene. Later when the river changed its course, the whole area was transformed into semi-desert. 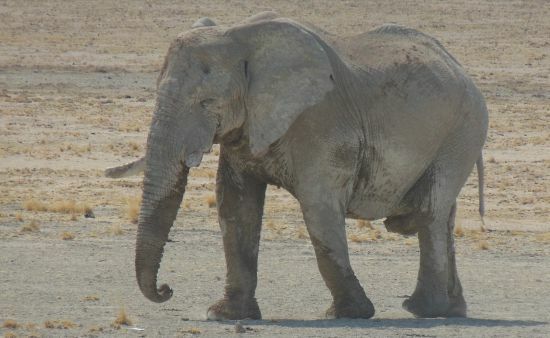 During the rainy season the Pan is sometimes flooded, but during the dry season it becomes a desert again and its sun-cracked saline surface turns the dazzling white that gives the area its name: Etosha. The park has 3550 kilometres of unsealed roads, but they are in good condition – you can even travel them in your own car. 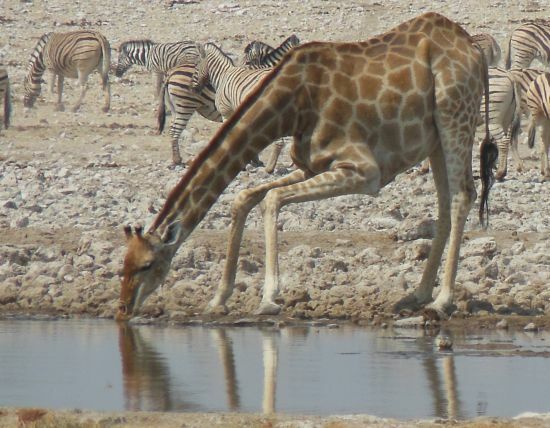 Within the confines of the park there are 86 water wells (both man-made and natural) where local wildlife come to drink, especially during the dry season which lasts from April to December. Our vehicle moved forward slowly and came silently to a stop: the only sound was that of camera shutters clicking as the photographers on board immortalized zebras, gazelles, antelopes, kudus and elephants as well as the recently reintroduced rhinoceros, both black and white ones. There were birds too, of all sizes and species, including flamingos, herons and pelicans. Out of sight in the shade of distant trees were the lions. When hunger moves them to shake off their heat-induced torpor, they constitute a serious threat to most of the other animals. 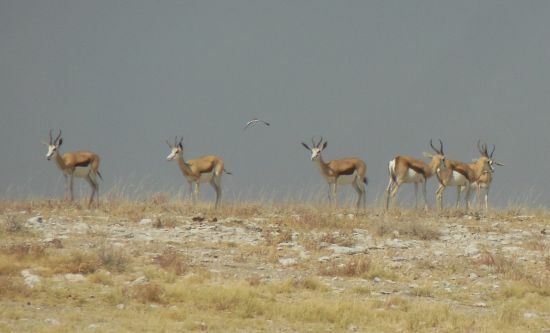 Etosha Park has almost no vegetation, but there are several species of acacia whose thorns and yellow flowers are greatly appreciated by giraffes, kudus and gazelles alike. Many of the animals tended to wander onto the road and our driver had to be continuously on the alert. 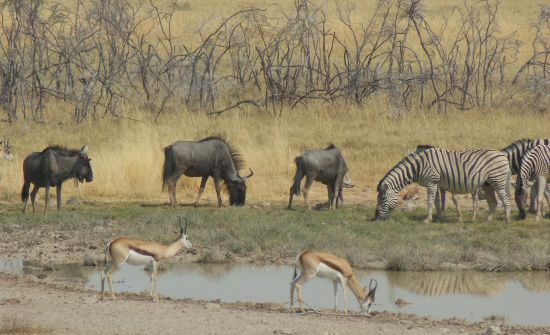 We stopped for lunch at Halali and in the evening, after a brief stop at the Namutoni entrance to the park, we checked in to the Mokuti Etosha Lodge. Namutoni was built by the Germans as a fort in 1902, and later it was used as a checkpoint and military base. In 1950 it was declared a national monument and opened to tourists in 1957. I spent the next day relaxing at the Lodge, preparing for the final haul back to Windhoek. As it turned out the 540-kilometre return voyage was much less tiring than I had imagined, travelling on pothole-free asphalt roads all the way. The landscape was rather monotonous although we saw signs of private enterprise along the road, including breeding farms for protected animals and regular livestock as well as commercial farms selling high quality produce. In Windhoek I spent the night at the Protea Hotel, meeting up with Giancarlo, one of my son’s friends, who took me on a tour of the capital. Windhoek is a small town and doesn’t boast many tourist attractions. It was founded in 1890 with the building of the Alte Feste “Old Fortress” by the Germans. In 1915 South African troups occupied the town on behalf of the British, bringing the German colonial era to an end. After the Second World War, Windhoek’s development was given new impetus and after 1955 many important public works were undertaken including the building of new schools and hospitals, asphalting of roads and building of dams. When Namibia won its independence from South Africa’s apartheid regime in 1990, Windhoek became the seat of Namibia’s first democratically elected government headed by President Sam Nujoma. The martyrs or “heroes” of the independence movement are honoured on a memorial plinth at Heroes Acre on a hill near Windhoek. This monument was financed by North Korea, a country which like Cuba had always supported local struggle against the regimes propped up by South African apartheid both in Namibia and Angola. It was time for me to leave; after a long wait at the Windhoek airport and an unexpected change of airline carrier, my flight finally took off, headed for Cape Town and the waiting arms of my son and daughter-in-law. The adventure was over!